Washington: Defense officials tell ABC News that Gen. Stanley McChrystal’s request for more troops for Afghanistan may arrive at the Pentagon by week’s end. It is unclear how many additional troops McChrystal may request beyond the 68,000 already slated to be in the country by year’s end. 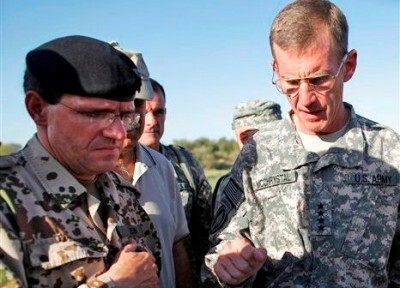 Speculation has been that he may request anywhere from 10,000 to 40,000 more troops for the mission in Afghanistan. The request for additional troops and resources, formally known as a “Request for Forces,” is separate from the detailed 66-page security assessment produced by McChrystal that was leaked to the Washington Post on Monday. The timing of the troop request has been a topic of hot discussion in the three weeks since McChrystal’s assessment was delivered to the Obama administration and NATO. President Obama’s comments on several of the network talk shows this week indicated a troops request would have to await a review of the administration’s strategy for Afghanistan and Pakistan. “I just want to make sure that everybody understands that you don’t make decisions about resources before you have the strategy ready,” he told George Stephanpoulos on ABC’s “This Week”.